The campaign by The Royals combines taking showers and doing global good. Social enterprise Thankyou is celebrating the little known National Shower for Good Day, in its first major campaign for body wash. Created by The Royals, the push tells Australians that body wash can make you smell good while doing good. National Shower for Good Day kicked off on the 12 March, then again on the 13 March, 14 March … right up until 31 March, because every day can be a shower for good day with Thankyou’s body wash, with 100% of profits committed to ending global poverty. “In the 10 years since we launched Thankyou, we’ve given more than $6.2 million to end global poverty in 20 countries, including Australia, because Aussies chose us when walking down the aisles,” Thankyou co-founder Daniel Flynn says. The campaign includes a partnership with Nova and Smooth FM, Spotify and runs across social, street posters, online and CRM. 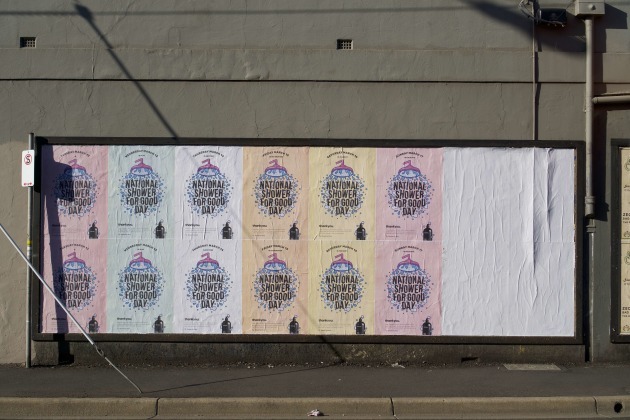 The street posters were posted daily, with each date positioned next to the previous day’s posters.